'Art has the potential to create a new Gospel every day,' Martin continues. 'Not a different one, but a new one ...' It is the Incarnation, Martin believes, which makes this creativity possible. The centrality of the Incarnation and what this means regarding how we relate to the Earth and to each other is powerfully conveyed in a number of essays. Yurodivy, a meditation on the Russian concept of the Holy Fool by Therese Schroeder-Sheker, stands out in this respect, as does Scott F. Martin's The Benthic and the Celestial, a reflection on the great sea of life surrounding us, which our limited human vision fails to perceive, from the microcosmic to the angelic. Perhaps the most notable contribution here is Little Green Men Against Muddy Red Creatures by Sebastian Montiel and Aaron Riches. The authors compare Pope Francis's encyclical, Laudato Si - an example of a God-centred ecology, with men and women as stewards of God's creation - with Antoine de Saint-Exupery's fable, Le Petit Prince, which offers a superficially attractive, yet ultimately a less grounded and much colder vision of our relationship with the environment. Who were born at the end? Are we the best, or the worst of men? Or demons in human form? We are stewards. Stewards of our souls and stewards of the land with big jobs to do. That's my response to Upton's questions, and I feel that's the answer Jesus the Imagination makes too. Whetmore's interview reminds us that despite current difficulties, there is still everything to play for spiritually. Our age, in fact, might be less about apocalypse and more to do with arrested development, a spiritual and mental stage akin to adolescence which God is asking us to transcend. In pre-modern times men and women felt close to God in an intuitive, often unconscious, and usually highly collective fashion. We have lost that bond today but we are called to regain it, not by 'following an antique drum' as T.S. Eliot says in Little Gidding but by actively choosing the Good - which we now have the capability to do - and becoming fully conscious partners with the Divine in a way that our less individualised ancestors never could. We have to find a way of letting this individualised consciousness lead us closer to God rather than further away. The great problem today, however, is that an excess of individual liberty - with 'choice' seen as the sole and supreme good - is corroding the political and social foundations of the West. We are ruled by an increasingly illiberal form of liberalism which lacks coherence (politicians and commentators, for instance, championing LGBT rights and an increased Islamic presence) and seems bent on undermining any sense of objective standards and values. It is not surprising, in such a climate, that many Christians are advocating a complete withdrawal from the secular world and the creation of alternative, 'underground' networks of co-religionists as the only way traditional faith-based communities can weather the storm and build for a more sympathetic future. 'We need to be in the resurrection business.' That, for me, is the key sentence. It's no good hunkering down, going 'off grid' and hoping that the illiberal liberal state will somehow ignore us. It's pointless planting seeds for better times ahead if all we can offer in tough times is a defensive posture and a surrender of the public square to the enemy. It's always better, surely to goodness, to go to the place of attack and live out our faith with such verve and panache that our faces shine and people cry out in astonishment, 'I never knew that that's what being a Christian was all about.' The 'living water' Christ offers the Samaritan woman in the Fourth Gospel is offered to ourselves too. It contains everything we need and want - from the wildest ecstasy to the profoundest peace, and more besides - the healing of harms and the fulfilment of our deepest, most secret desire - that all-consuming passion for Reality and Truth, which is hard to articulate, leads us down blind alleys at times, expresses itself oddly at others, and which the mind forgets but the heart remembers and stores up in itself, waiting for One to come to speak the Word of power, break the dam and bring the whole lot flooding out. Only then do we become Real. Only then does the living water flow; in ourselves and in our communities. The Waste Land is healed and life begins anew. This is the resurrection business, and this is what Jesus the Imagination brings to the table. 'Come,' says the woman of Samaria. 'See a man, which told me all things that ever I did.' She might have added, 'and all the joys, sorrows, hopes, fears, thoughts and dreams that ever I had.' If people could come to understand - not just intellectually, but in their bones - that this is the heart of Christianity - this level of intimacy, empathy and encounter - then the false paths to fulfilment offered by the world would lose their allure and we could begin to talk seriously at last about the possibility of a Christian renaissance. This is the tightrope that Jesus the Imagination walks, and it does it with panache, style, and no little success. It's publication is a massive step in the right direction. It is not without its faults, of course. Some of the poetry lacks a bit of edge, while one or two of the essays read like they have been translated from a foreign language, and not very well either. But these are trifling caveats when set against the largeness of vision and the passion, flair, and sheer spiritual vitality that bristles between its covers. The only questions that remain are for the readers of this blog. Jesus the Imagination is universal in its themes but naturally tends to speak with a North American voice. What then would a British-based equivalent look and feel like? What would be its raison d'être? How might it get its point across? What could we expect to find on its contents page? Does anyone see value in such a venture and feel ready to risk taking it on? Our thanks are very much due to Michael Martin then, for showing us what can and indeed must be done at this hour. 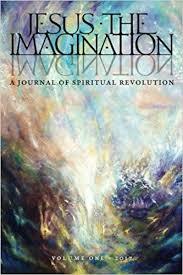 Jesus the Imagination Volume One can be purchased at the Angelico Press site here. Volume Two has recently been published and can be purchased at the same site here. Its theme is 'the being of marriage', and features an interview with legendary Liverpool music collective, The Revolutionary Army of the Infant Jesus. As a sample of their work, check out what they do with R.S. Thomas's poem, The Bright Field, in this beautiful clip. Jesus the Imagination also has a Facebook group which can be found here. Dreher is to be commended for writing his call for Christians to "strengthen the things that remain." Yes, we need occasionally to take note of further advances by the enemy, since there is a war on, but we should remember that Christians are to be prepared to give an account of what they have done with the time and resources entrusted to them. I hope that a lot of people who visit this blog and may have heard of Dreher's book, and who think they already know what it says, will take time to read it for themselves. Good point Dale, thanks very much.